The folks at SimulationIQ of Education Management Solutions recently shared this article published by the Journal of the Association of American Medical Colleges entitled “What Is a 21st-Century Doctor? Rethinking the Significance of the Medical Degree” by Olle ten Cate, PhD. What is the core knowledge that medical doctors should possess? 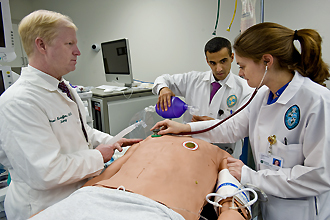 What signifies the medical degree within the continuum of medical training? Is the trajectory to highly specialized medical practice too long? To what extent is medical practice still the prerogative of medical doctors? How must international medical graduates be recognized? Is the medical profession becoming an occupation? Is It Time to Rethink the Medical Degree? Ask anyone in the street to pick one profession on earth that stands out for its well-defined status, and the medical doctor will soon be mentioned. Societies have had professionals caring for the health of citizens as long as mankind has existed.7 Over time, healing became the prerogative of certified professionals. As early as in 2000 BC Babylonian society,8 documented rights and obligations began to signify the social contract between a medical professional community with distinct knowledge and skills and the society’s collective citizens. Medical doctors, initially modeled after Asclepius and Hippocrates, became university-educated professionals, and in the 19th century, theoretical university study combined with practical experience as an apprentice became a certification requirement for the medical doctor.7,9 In virtually all countries, certification is now grounded in national legislation. The degree of medical doctor, awarded by a university, and the right to practice the medical profession, granted by registration as a medical practitioner, mark a rite of passage into the professional community. The medical degree seems solidly rooted in society. However, the professional world of health care has dramatically changed in the 20th century. Abraham Flexner, reporting a century ago about the state of U.S. and European medical education,10 did not yet mention internships or any hospital training after graduation. This reflected the prevailing practice of relying on undergraduate medical education as sufficient preparation for lifelong medical practice.9 At that time, Dutch medical diplomas were signed not only by university authorities but also by the city mayor, certifying service to the local community for many years. Additional postgraduate specialty training was an exception, only later becoming the norm for medical graduates. In the 21st century the medical degree, while still significant in its legal status, has become an intermediate station in a long educational trajectory, rather than an end point. In addition, its status has become much less clear, and we might wonder whether we are approaching the end of the MD status as we have known it for many decades. Six questions should make us rethink this status. You can read the full AAMC article here and be sure to check out the SimulationIQ article list for more great content!